A landmark of Belgrade, this striking hotel first opened in 1957 and is regarded to be one of the most luxurious hotels in the Balkans, welcoming throughout its existence the city’s elite as well as famous clientele, ranging from Igor Stravinsky, Elizabeth Taylor and Sophia Loren to Jack Nicholson, Neil Armstrong and Bobby Fischer. The hotel features 198 guestrooms and 30 suites, including 150 square meters Presidential Suite, looking out to one of Belgrade’s most beautiful parks and exude a contemporary feel, but reference the mid-twentieth century, the time when the hotel was built. Different kind of spaces in hotel, such as ballrooms, conference halls, the restaurant and lobby can accommodate all types of events, ranging from conferences, dinners, private parties, to wedding receptions, meetings and much more. At Metropol Palace Hotel there is a fine dining restaurant, where are served local flavor and international specialties as well as Rooftop restaurant where can be organized various types of events. In addition to hotels exciting location and luxurious accommodation, the guests of the Metropol Palace Hotel can enjoy the most modern spa and fitness centre with a pool, sauna, Jacuzzi, steam bath and special treatments. Hotel Metropol Palace has: Clasisic rooms 26, Superior rooms 66, Deluxe rooms 106, Junior Suite 21, Executive Suite 10, Special Suite 5, Duplex Suite 1, Presidential Suite 1. Rooms for disabled persons - 2 Superior Rooms. The Metropol Palace (part of Luxury Collection Hotel), represents an impressive and perfect venue all types of events (business conferences, memorable weddings, receptions and private events). Within the hotel there are 9 meeting rooms for seminars, conferences, congresses, banquets and all kinds of events which will meet the needs of event organizers. Hotels conference halls can accommodate up to 870 delegates and with a highly personalized level of service hotel staff will ensure that every moment at Metropol Palace will be a great success. Parliament Building and the Church of St. Mark are in the nearest vicinity. 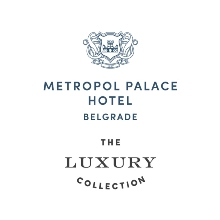 Metropol Palace is within a 20-minute walk of Knez Mihailova Street with many shopping opportunities, the historic Kalemegdan Fortress and the bohemian area Skadarlija. Main Bus And Train Station is 1 mile away, and the nearest access to the A1 Highway is 1 mile from the hotel. Nikola Tesla International Airport is 12 miles away.